Their innovation at working within design’s constraints inspired the likes of Arne Jacobsen in the midcentury and designers and craftsman today like Nicole Hodsdon of Ciseal. A Noguchi Coffee Table is a functional sculpture in this living room. Photo by Jim Brown. An abstract sculptor as well as a furniture designer, Noguchi’s furniture and lighting designs are unmistakably sculptural. Think of his namesake coffee table and Akari light sculptures (including table, floor and ceiling lamps). Noguchi was born to a Japanese poet and an Irish-American teacher, and his work reflects both Western and Eastern influence. Arne Jacobsen designed his Egg Chair to furnish a hotel he designed as architect. Photo by Jim Brown. A Danish architect inspired by an Eames plywood chair, Jacobsen designed his three-legged Ant Chair. His iconic chair designs include the Egg Chair, Drop Chair, Grand Prix Chair and Swan Chair. His furniture designs grew out of his specific architectural projects—the Egg and Swan Chairs were for the SAS Hotel in Denmark. His architectural approach to furniture is evident in his well-proportioned design. While elegantly proportioned, the designs also have a personal touch with their playful shapes resembling a free-form drawing. 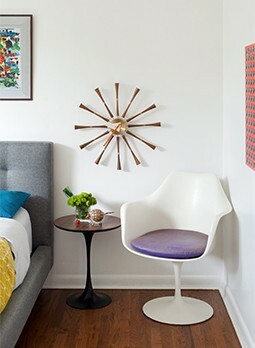 A Bertoia Diamond Chair in the back right showcases the designer’s dexterity with metal. Bertoia also worked as a jeweler and later in his career made metal sculptures such as the Dandelion Burst. Photo by Jim Brown. “The urge for good design is the same as the urge to go on living. The assumption is that somewhere, hidden, is a better way of doing things,” Bertoia said. Whether it was jewelry, sculpture or furniture, Bertoia’s search for a better way of doing things yielded some of the midcentury’s most iconic designs. Multi-talented, Bertoia also had very talented friends. He was classmates with Eero Saarinen, Charles Eames and Florence Schust (Knoll) at Cranbrook. 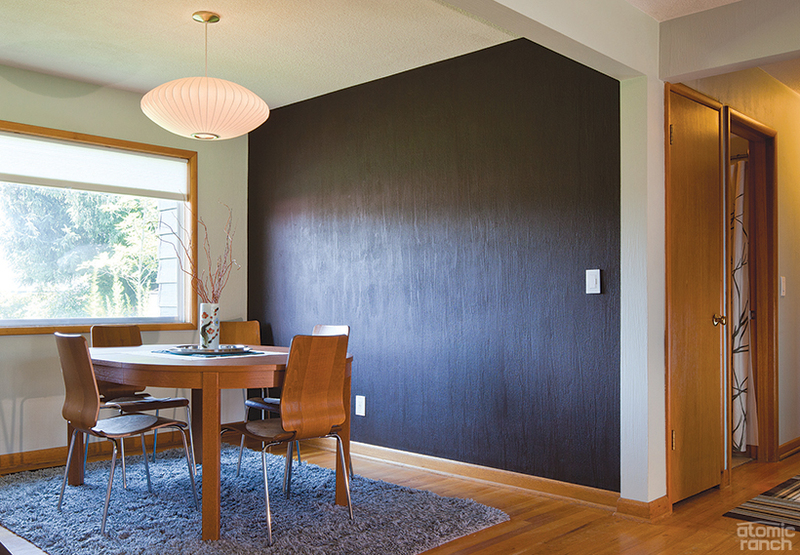 He and Charles worked on an award-winning bent plywood project. His friendship with Florence Knoll became a fruitful one as she commissioned him to design for the design company Knoll. His Diamond and Bird Chairs came from this commissioning. 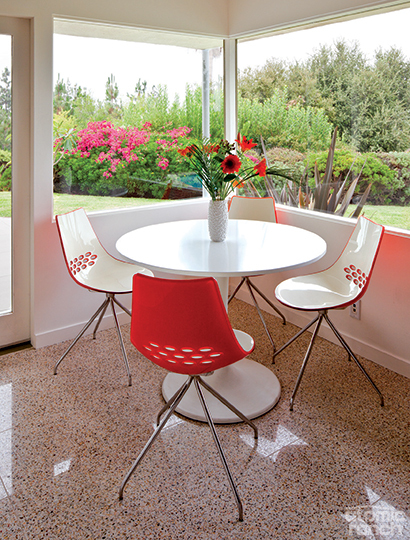 A Saarinen Pedestal Table offers a sleek silhouette and eliminates the traditional four supports, which he referred to as “the slum of legs.” Photo by Jim Brown. 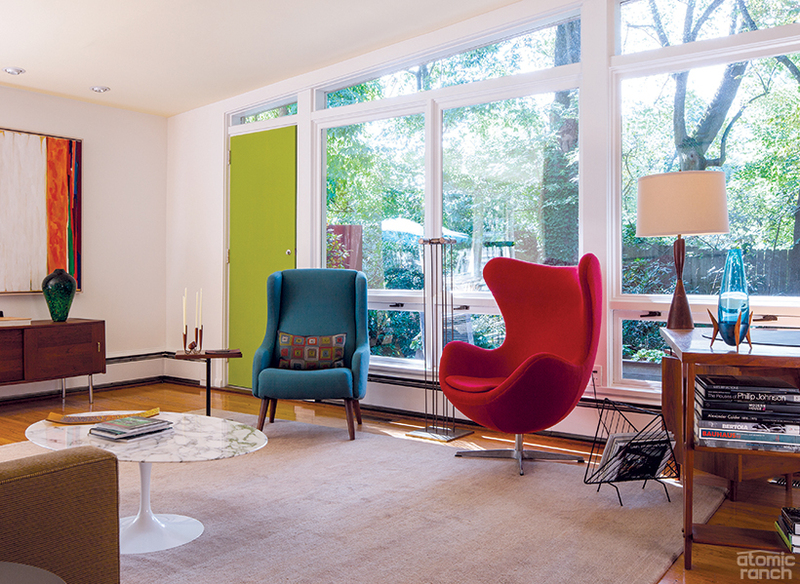 Considered a leader of the second generation of Midcentury Modern, Saarinen introduced the curvilinear into the MCM landscape. Educated at Cranbrook with talented friends such as Charles Eames and Florence Schust (later Knoll) and with an artistic heritage from his parents—architect Eliel for a father and textile designer Loja for a mother—Eero Saarinen was well-positioned for an illustrious career. 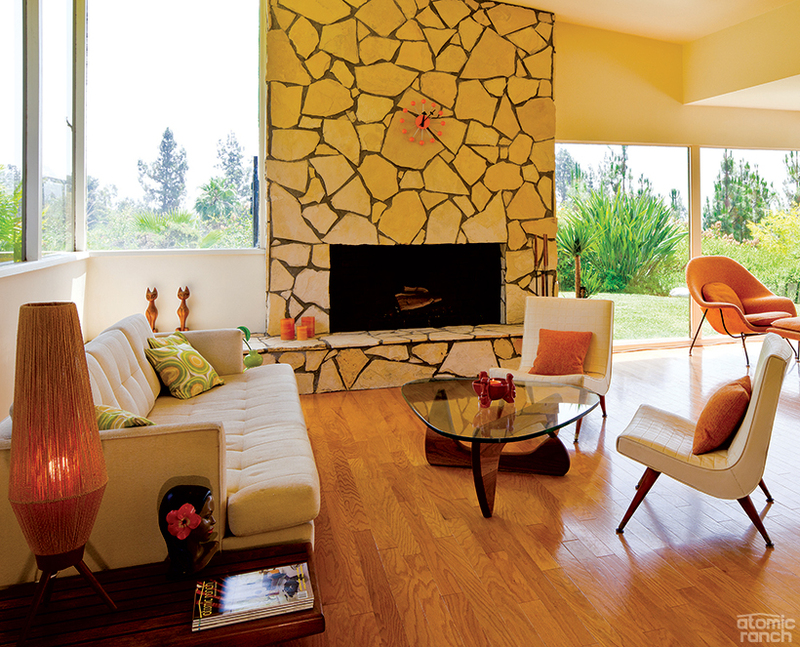 A George Nakashima dining table fits in yet adds warmth to this Midcentury Modern-rich room. Hans Wegner Wishbone chairs, for instance, pair perfectly. Photo by Jim Brown. 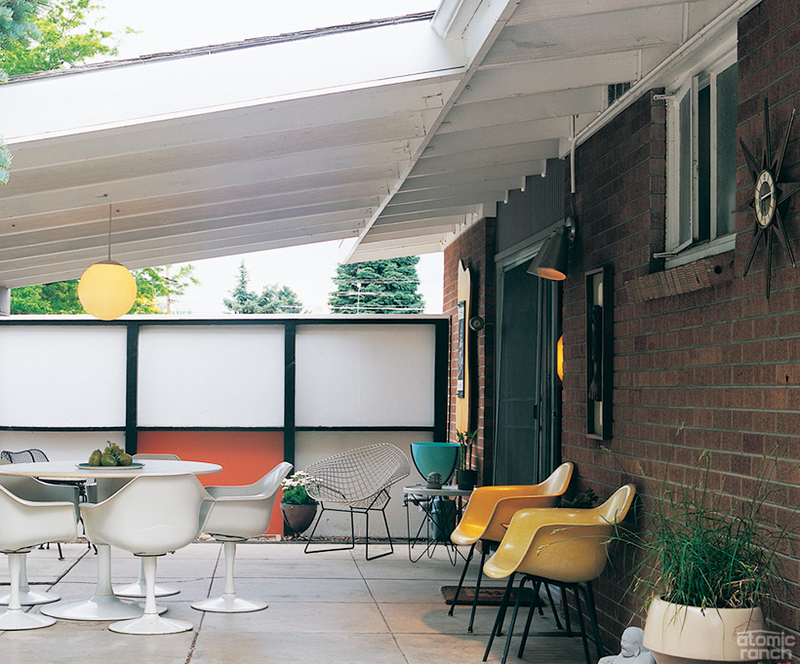 While part of the Midcentury Modern movement embraced mass production with industrial materials and production as a way of making designs more affordable, other designers within the movement called back for the natural and handcrafted. (Sound familiar, hipsters?) George Nakashima was one of the foremost designers in the American Studio Craft Movement, which also included Sam Maloof. Nakashima worked primarily with wood, and his designs embraced the uniqueness of the natural material.In fact, his memoir is titled The Soul of a Tree, reflecting his profound respect for the wood out of which he formed his life’s work. His designs feature classically modern clean lines as well as organic shapes. 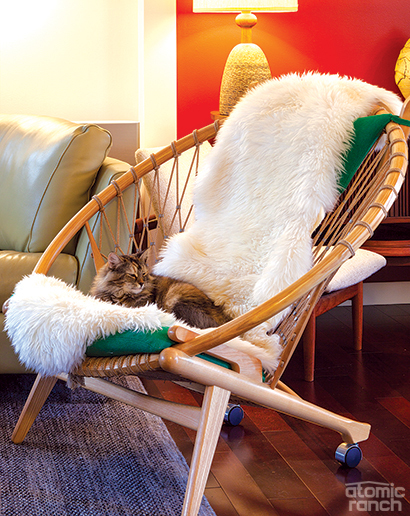 Even felines get to enjoy Wegner chair designs such as this Hans Wegner Hoop Chair. Photo by Jim Brown. With over 500 chair designs to his name, Hans Wegner is commonly dubbed the “Master of the Chair.” An important figure in the Danish Modern movement, the elegant simplicity of his designs and respect for materials such as wood gave him international renown. 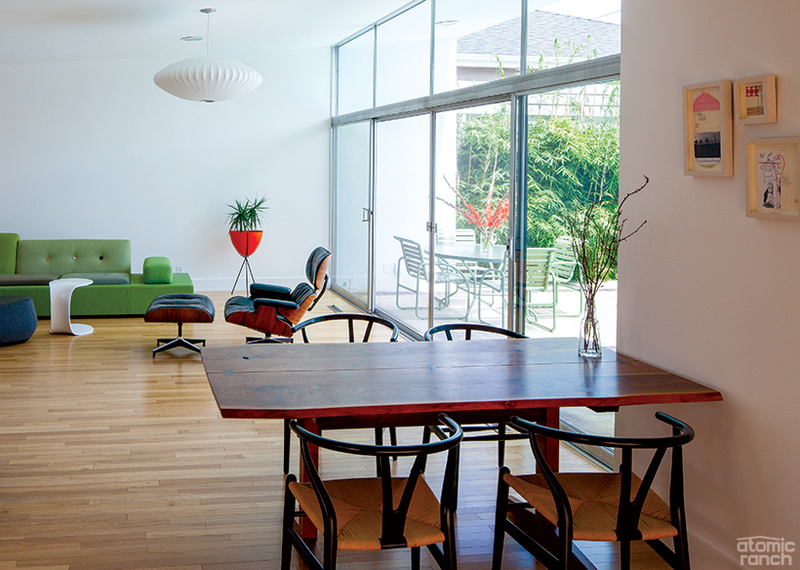 A pair of Jens Risom’s Ox Chairs star in this living room. Risom reportedly drew his inspiration for the chair from the work of Picasso. Photo by Jim Brown. After emigrating to the US from Denmark, Jens Risom and Hans Knoll formed an influential partnership. Through his relationship with Hans Knoll and his role as the design go-to as Knoll was beginning his furniture company and later through his own eponymous furniture company, Jens Risom is credited with introducing the American public to Danish Modern. 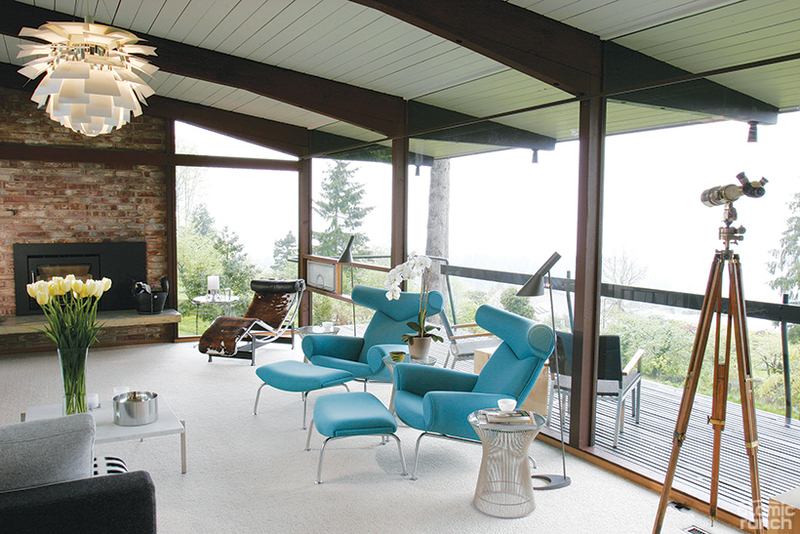 His most famous designs include the Risom Rocker, desk and lounge chair. “Good design means that anything which is good by itself will go with other things,” he said. George Nelson’s innovative Bubble Lamp presides over a dining table. Photo by Jim Brown. “Total design is nothing more or less than a process of relating everything to everything,” George Nelson said. His designs related previously unrelated things in ways that changed the shape of furniture design. His Storagewall, for instance, introduced the world to modular storage. His Bubble Lamps also reflected his ability to put unrelated things together. Inspired by the design of lamps he’d seen in Sweden that were prohibitively expensive, he came upon the solution for making an affordable variation on the design when he read about self-webbing plastic spray which the military used to “mothball” planes and ships. Nelson’s designs as well as his tenure as Director of Design at Herman Miller makes him a towering, influential figure of the Midcentury Modern movement.